For the development of novel seasonal solar sorption storage for buildings the project partners AEE INTEC, GREENoneTec, IWT TU Graz, Odörfer, Somitsch and STM Meitz work together to develop a thermochemical storage system for a single family house. The main goal is the component and system development and optimization of the complete system. With the heat of the solar collector the sorption material in the storage vessel is dried. The released vapour is flowing to the condenser, where it is condensed. The water flows back to the water reservoir and is stored separately. When heat is needed, the water from the water reservoir is pumped to the heat exchanger which is in this case operated as evaporator. The vapour flows via vapour channel to the storage and is adsorbed by the material. Due to the thermochemical reaction heat is released, which is extracted and then delivered to the distribution system. 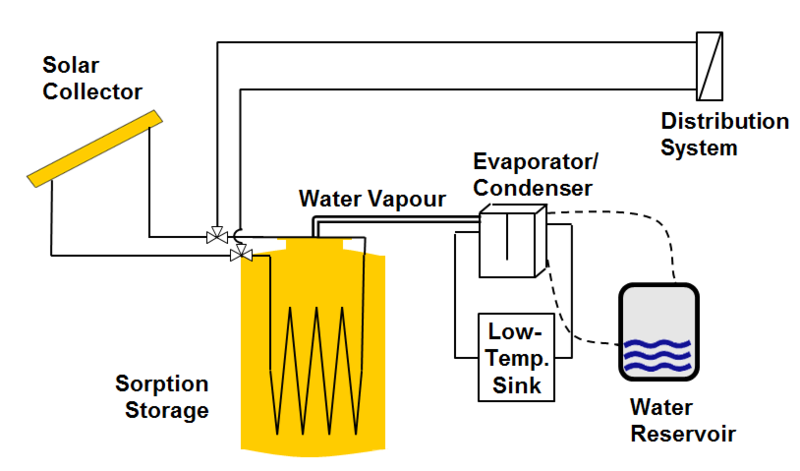 The system is operated in vacuum, hence the delivered energy for evaporation from the low temperature side is on a low temperature level (<20 °C). The chosen material pair for the sorption process is zeolite 13XBF and water. The zeolite shows a high adsorption capacity and hence also a high energy density. The disadvantage is that the material usually needs high desorption temperatures above 200 °C to regenerate effectively. These high temperatures can be avoided by using the so called charge boost mode. Therefore one aim of development line A is to achieve high energy densities with low desorption temperatures by repeating the charge boost mode, because lowering the desorption temperature is an important cost reduction factor.